Draft: 2014, Cleveland Indians, 5th rd. Julian Christopher Merryweather ... Attended Junipero Serra HS in San Mateo, CA where he went 8-1 in his senior season (2010) ... Pitched two seasons at Oklahoma Baptist University in Shawnee, OK, combining for a 22-5 record and a 1.73 ERA (35 ER/181.1 IP)... Recorded 11 complete games in 28 starts. Suffered a right elbow UCL sprain in spring training ... Underwent Tommy John surgery on March 9...Was operated on by Dr. Keith Meister ... Was traded from the Indians to the Blue Jays on Oct. 5 as the Player To Be Named Later for their Aug. 31 aquisition of INF Josh Donaldson. Split season between AAA Columbus and AA Akron, going a combined 7-9 with a 5.32 ERA in 25 starts (128.2IP, 142H, 76ER, 16HR, 35BB, 128SO)...Started the year at Akron and was promoted to Columbus on May 29...Was on the Triple-A D.L from June 23-July 7 with lower back tightness...In his Columbus debut he posted 8.0 shutout innings(3 hits)with 0 walks and 8 strikeouts...Was tied for fourth in the organization with 128 strikeouts...Fanned career-high 10 batters in 6.0 IP on May 12 at Binghamton. 4 de abril de 2019 Buffalo Bisons ponen a RHP Julian Merryweather on the 7-d&iacute;a lista de lesionados. 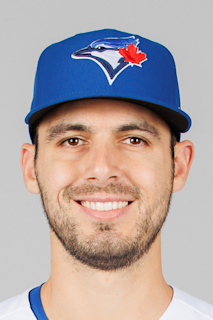 12 de marzo de 2019 Toronto Blue Jays opcionado RHP Julian Merryweather para Buffalo Bisons. 5 de octubre de 2018 Cleveland Indians cambian a RHP Julian Merryweather a Toronto Blue Jays. 2 de octubre de 2018 Cleveland Indians llamado RHP Julian Merryweather de Columbus Clippers. 6 de abril de 2018 Columbus Clippers ponen a RHP Julian Merryweather on the 7-d&iacute;a lista de deshabilitado. 12 de marzo de 2018 Cleveland Indians opcionado RHP Julian Merryweather para Columbus Clippers. 20 de noviembre de 2017 Cleveland Indians seleccionado el contrato de Julian Merryweather de Columbus Clippers. 8 de julio de 2017 Columbus Clippers activan a RHP Julian Merryweather de la 7-d&iacute;a lista de deshabilitado. 26 de junio de 2017 Columbus Clippers ponen a RHP Julian Merryweather on the 7-d&iacute;a lista de deshabilitado retroactivo al June 23, 2017. 29 de mayo de 2017 RHP Julian Merryweather asignado a Columbus Clippers de Akron RubberDucks. 19 de septiembre de 2016 Akron RubberDucks activan a RHP Julian Merryweather. 13 de septiembre de 2016 Akron RubberDucks ponen a RHP Julian Merryweather en la lista de reserva. 26 de junio de 2016 RHP Julian Merryweather asignado a Akron RubberDucks de Lynchburg Hillcats. 5 de junio de 2016 Lynchburg Hillcats activan a RHP Julian Merryweather de la 7-d&iacute;a lista de deshabilitado. 23 de mayo de 2016 Lynchburg Hillcats ponen a RHP Julian Merryweather on the 7-d&iacute;a lista de deshabilitado retroactivo al May 20, 2016. 5 de abril de 2016 RHP Julian Merryweather asignado a Lynchburg Hillcats de Lake County Captains. 28 de septiembre de 2015 Lake County Captains activan a RHP Julian Merryweather de la 7-d&iacute;a lista de deshabilitado. 28 de agosto de 2015 Lake County Captains ponen a RHP Julian Merryweather on the 7-d&iacute;a lista de deshabilitado. 20 de junio de 2015 Lake County Captains activan a RHP Julian Merryweather de la 7-d&iacute;a lista de deshabilitado. 26 de mayo de 2015 Lake County Captains ponen a RHP Julian Merryweather on the 7-d&iacute;a lista de deshabilitado. 6 de abril de 2015 RHP Julian Merryweather asignado a Lake County Captains de Mahoning Valley Scrappers. 13 de junio de 2014 RHP Julian Merryweather asignado a Mahoning Valley Scrappers. 10 de junio de 2014 Cleveland Indians firmado RHP Julian Merryweather.